I know it drives me nuts when I am asked multiple times if I want to delete vlan.dat, reload, and so forth. Blindhog has a video up to help your sanity with this. “Do you get annoyed by Operating systems asking you if you are sure you want to perform an action 10 times before it will actually do what you want? Sometimes I just think that I hate IPv6 so much my brain just refuses to let any of it in, kind of like Golf. So I stumbled upon Arden’s write up and got it cleared up right away. After reading his post it became simple to me which brings me back to it is just my brain that refuses to embrace IPv6 as a whole. Update on IEWB-RS Volume 1 Version 5 over on Internetwork Expert’s blog. I am more than half way done with the current COD for the second time and now there is a new version comingÂ out that is three weeks long instead of two lol! â€¢ Before performing the tasks in this module, you should be familiar with the concepts described in “IP Multicast Technology Overview” module. 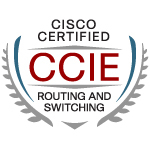 â€¢ You must have enabled multicast routing and performed at least one basic multicast configuration task. Refer to the “Configuring Basic IP Multicast” module for more information. Perform this task to start using IP multicast in your network. If all the multicast-capable routers and access servers that you administer are members of a multicast group, pinging that group causes all routers to respond, which can be a useful administrative and debugging tool. Another reason to have a router join a multicast group is when other hosts on the network have an Interior Gateway Routing Protocol (IGRP) configuration that prevents them from correctly answering IGMP queries. Having the router join the multicast group causes upstream routers to maintain multicast routing table information for that group and keep the paths for that group active. He passed his lab last Thursday. Congrats! Well I got through most of day 4 of the cod. I am about halfway through the multicast. I swear while going through BGP day 3 or 4 I heard Brian McGahan try to silence a burp while talking… It could of just been my noise cancelling headphones as well I guess. I took some time off Sunday to start getting the nursery in order. That meant pulling out the spare bed in there that I was sleeping on since the wife kicked me out of “our” bed… Best advice I can ever offer anyone “always let your pregnant wife win!” It will protect your physical being in the long run. Hopefully I can finish off the multicast section and move through day 5 this week. The wife is about 3 1/2 weeks away from her 37th week. Anytime after the 37th week is fair game for labor :). That means I really need to get moving on the rest of the rooms. It would be really helpful if the wife would just pick a CRIB out already!!!!!!! Please? Oh how about picking out his dresser as well sweetie? Hello? Anyone there? Here is the link for the apology on NetworkWorld.